Conventional wisdom suggests that the brain grows all of its neurons before birth, and therefore learning and memory in adults must involve changing the strength and patterns of connections between existing neurons. This is true in many regions of mammalian brains. However, in two specific areas, the hippocampus and the olfactory bulb, new neurons are continuously regenerated throughout adult life enabling learning and memory to change with the replacement of whole neurons. The Lledo lab seeks to unravel the function of new neurons in the olfactory bulb by determining how they form and receive connections in an already existing neural network, and ultimately how this influences olfactory behaviour. New optogenetic tools have revolutionized neuroscience by letting researchers use optics to monitor or influence genetically defined sub-populations of neurons. 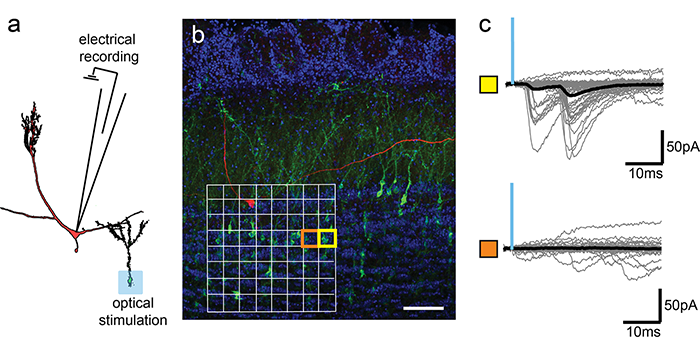 Optogenetic experiments are ideally suited to untangle heterogeneous groups of neurons, and so the mixed population of young and old neurons in the olfactory bulb presents an ideal application for optogenetic tools. Using channelrhodopsins, for instance, the Lledo lab has shown how the specific stimulation of neurons born in the adult can uniquely influence olfactory behaviour (Alonso et al. 2012), and how they make unique output synapses (Valley et al. 2013). To make a detailed study of how new neurons form new synapses, experimentalists must control how many synapses they can stimulate. The Lledo lab uses the Andor MOSAIC DMD to spatially restrict light in order to stimulate one or a few adult-born neurons at once. The studies engage a combination of illumination of a target synapse with down-stream neuronal electrical recording (fig a). By sequentially projecting squares of light in a checkerboard pattern (fig b), they can also map the synaptic connectivity of adult-born neurons (fig c). In some cases this search can reveal just one or two synaptic connections allowing them to measure the detailed parameters of these synapses. With many connections in the tissue, mapping also parallelizes the task of studying synaptically connected pairs of neurons, greatly accelerating the pace of data collection. Optogenetic mapping of synaptic connectivity between olfactory bulb granule and mitral cells. a) Schematic of a mitral cell and granule cells showing the experimental setup using optical stimulation of channelrhodopsin-2 (ChR2, blue square) to elicit an inhibitory post-synaptic current in a mitral cell (red) recorded using a patch-clamp pipette. b) Confocal reconstruction of a biocytin filled mitral cell (red) surrounded by ChR2-EYFP expressing adult-born granule cells (green) and all cell nuclei (DAPI, blue). The white 8x8 grid shows each square of optical stimulation with two representative stimulus regions shown in yellow and orange. c) Example traces showing the post synaptic currents evoked by stimulating ChR2 in the region labelled in yellow (top) but not by an adjacent region (orange, bottom). Scale in b = 50μm. Given the complexity of neuronal connectivity, the diverse array of sub-populations and their associated circuit characteristics, further work is required to pinpoint the ideal model system with which to employ the Mosaic DMD technology to best effect. The aim: to gain specific control of one or several neurons in a complex tissue, enabling experiments to probe the plasticity of their inputs, and the targets of their outputs. The Mosaic DMD can provide per pixel intensity control with arbitrary spatial patterning which enables each stimulation pattern to be custom tailored to the neuron of interest. This level of control is much desired for today's increasingly sophisticated experiments to study neuronal circuit’s in-vitro. The Mosaic 3 DMD system has become an essential technology for microscopy based optogenetics. The demands of this field are constantly growing and the Mosaic 3 DMD system has evolved with those needs. For instance, Andor has introduced the Mosaic Duet system which affords researchers the capability of dual-color simultaneous optogenetics over two distinct regions. This system has been used to simultaneously activate and inhibit distinct regions of a cell expressing the PIF-2/Phy-B system (Toettcher et al. 2011). One could envisage using the Mosaic 3 Duet to simultaneously activate distinct populations of neurons expressing two different opsins (Klapoetke et al. 2014). Pierre-Marie Lledo and Matthew Valley, Laboratory for Perception and Memory, Institute Pasteur and CNRS, Paris, France.